For once, I don’t have that much new and exciting to tell you regarding food today. 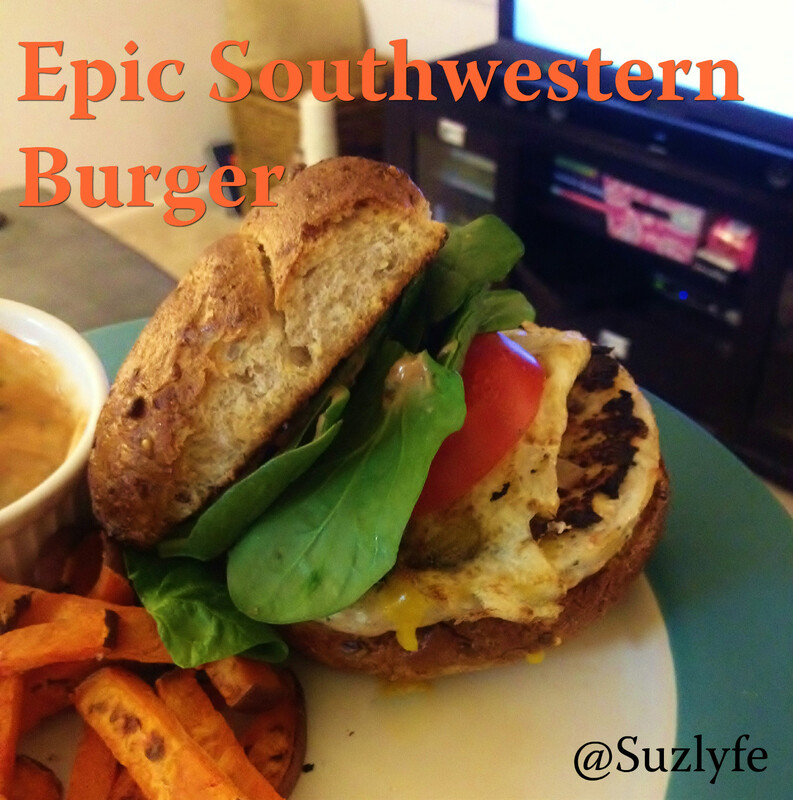 OH WAIT, I HAVE AN EPIC BURGER RECIPE TO SHARE WITH YOU for WIAW. A huge thanks to Jenn for party rocking!! I wasn’t all that sure what I was going to post today–I have talked a lot recently about staples in the kitchen, and with the baking staples talk of last Friday, I feel the need to put some of this discussion to use. So let us harken back to a few Fridays past, when I detailed various pantry staples for quick meals and no-fail sauces. Look forward this Recipe Friday to my quick and easy sauce recipes (at least, that is the plan for nowsies. And deal with the fact that I just used that word). Monday night, I had the lovely surprise of being able to come home and have dinner with Alex rather than spending it freezing at the resto. I hadn’t planned on this, so I had to improvise a bit with what I had on hand. A combination of store-ready ingredients and creative license made for one satisfying and delicious meal! 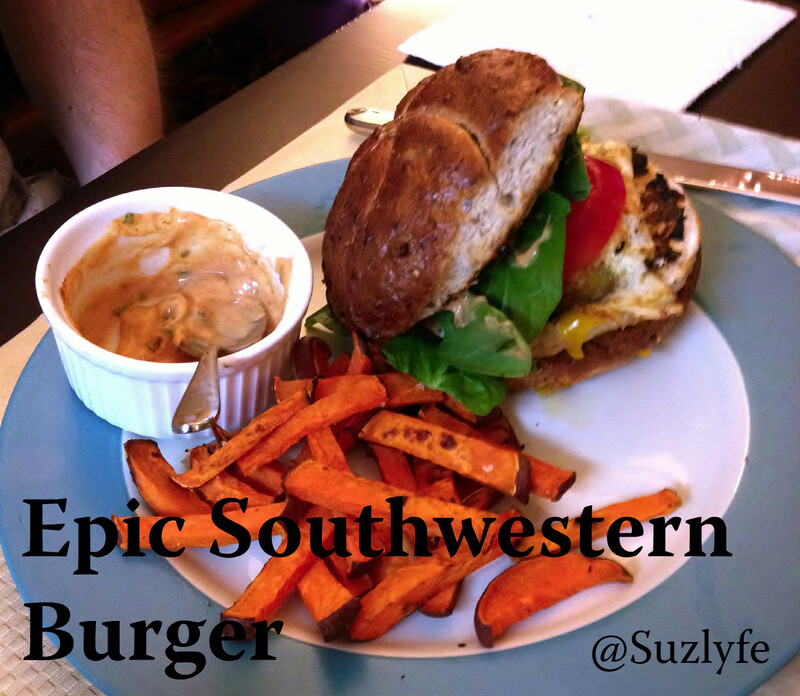 Take inspiration from bistro burger joints with the burger, combining fabulous southwestern flavors and one heckuva sauce. You have 2 options before you mix the patties: pre-pan saute the red bell and minced garlic, or just let it be. Depends on your liking/disliking of the 2 flavors. Depending on your decision, let the garlic and red bell cook until fragrant and slightly softened but not cooked all the way down. A little color at most. Let cool. In a mixing bowl, mix together burger ingredients, adjusting to your own tastes. Form into patties and place on a plate, taking the time to put a thumb indention in the center of the patties before you cook them for more consistent cooking. If you have time, set them in the fridge to let the flavors meld, and then remove 30 mins prior to cooking. Either way, let the patties sit for a time to come together). Heat cooking surface to medium-medium/high. While waiting for the pan to warm, mix up your aioli ingredients. When heated up, spray with cooking oil, season the face of the burgers with some salt and pepper, and plop those babies on there. While the first side is cooking, gather and prep the rest of your ingredients, and spread some butter/oil on the burger-side of your buns. Put a small saute pan on, about medium heat. After 3 or so minutes (depending), spray surface with oil, add sliced onion to surface and begin to cook, salt to help break them down. Flip your burgers after about 4 or 5 minutes (max, and also depending on the thickness). You want them cooked halfway, but not too far over half. Season the non seasoned half, and flip. Move the onions to the burger pan to finish cooking with the burgers and reduce heat to medium. In the small saute pan, crack your two eggs and pan fry as you desire. I flip so that the whites are set and there is a skin on both sides, but the yolk still runs. The eggs and burgers should finish at about the same time. (Cook the burgers until they are firm but not hard, they will continue to cook after being removed from heat). Remove them to an extra plate on the side, and return pans to heat, turn to the lower side of medium and put the buns butter down on the pans. Let toast, and turn off the heat. I served ours with baked sweet potato fries (amaze with the aioli). When coordinated, this is an easy, super flavorful meal that is incredibly good for you, beyond satisfying, and indulgent, taste-wise. The toppings and size of your burger enable you to make it as hearty as you want: I only had enough meat for the two of us to have a single patty (his being bigger than mine), so I added the egg for some extra umph. I wouldn’t use cheese, egg, avocado, and aioli all at once–that would be way too much fat/unctuousness and the amount of acid necessary to cut through the flavors would overshadow any flavors that you had worked so hard to develop! We were out of all of our salsas, but TJ’s Cowboy Caviar would be BOMB on this. I like the Miracle Whip on this a) because my stomach can handle it and b) the slight tang emphasizes the lime in the burger. Thanks for stopping by, and I hope that you enjoy! It was a fun, off-the-cuff recipe, but one that I will DEFINITELY be returning to. Next time, I want some Jalapeno’s in there!